We all know that plants have been linked to the wellness of man since the beginning of time. Ancient people used plants for medicine and first aid. The ancient Egyptians used essential oils for medicine, beauty, emotional support, embalming, and there were many recipes mentioned in the hieroglyphics for using essential oils for healing. Young Living Oils can be taken internally, diffused, inhaled, put directly on skin or dilute them. They are all natural, safe, and non-toxic. They are safe for everyone, even children, the elderly, and even your pets. Incorporating the use of essential oils into your daily life, through methods of direct application and diffusion, can help to improve our physical, mental, emotional, and spiritual health! 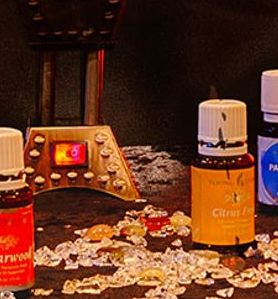 Young Living Essential Oils are of a pure, natural high vibration, which can aid in raising the frequencies of our personal space when diffused. Many clients have received wonderful benefits from using these precious oils!